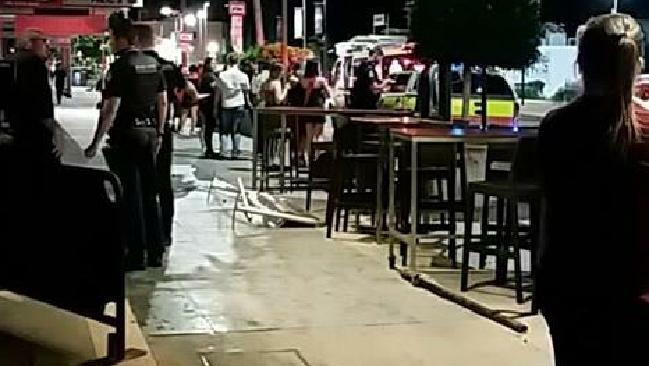 The scene of the crash on Flinders St.
UPDATE: Police have spoken with a male driver who allegedly hit a pedestrian in Townsville's late-night precinct on Tuesday. 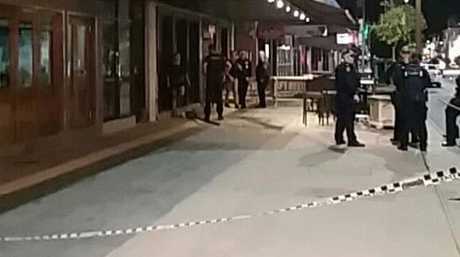 Witnesses said the driver had appeared "out of control" before his vehicle mounted the kerb and ploughed into a man standing on Flinders St about 11:30pm. Initial information suggested the driver allegedly left the scene, however a police spokesman confirmed officers had spoken to the driver a short time after the incident. The spokesman said witnesses reported seeing the pedestrian go over the bonnet of the car when he was hit. The 27-year-old pedestrian was taken to Townsville Hospital fully alert and conscious with rib and back pain. Shortly after the incident ambulance officers were called to return to the scene after a man, believed to be in his 40s, was suffering from shock as a result of witnessing the crash. EARLIER: An out-of-control vehicle has ploughed into a pedestrian in the late-night precinct of Flinders St tonight. The Bulletin understands the Toyota was driven by a man with a female passenger. The vehicle mounted the kerb near the Cactus Saloon, hit someone and the driver allegedly kept going. The vehicle came to a stop outside the Mad Cow. The dark grey Toyota was described as "out-of-control". A Queensland Police Service spokesman said the crash took place about 11.30pm. He said police understood the vehicle hit a man who was on the side of the street. "He's the only person being looked at by the Queensland Ambulance Service," the spokesman said. "It looks he went over the bonnet of the car." The Forensic Crash Unit was at the scene. A crime scene was declared at the scene and the Cactus Saloon was closed. Motorists and pedestrians were advised to avoid the area if possible.